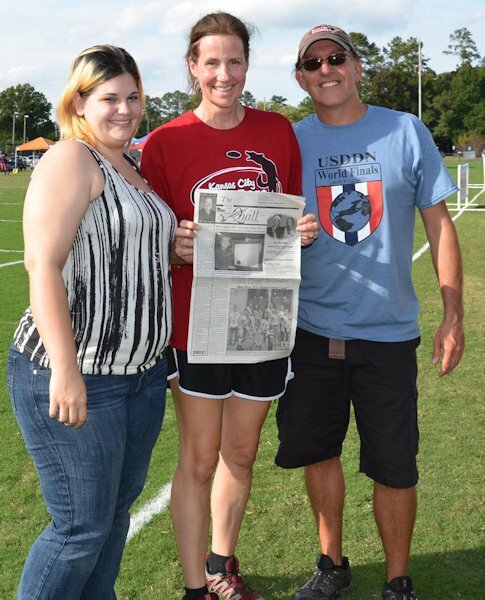 Jackie Rodeffer-Scheetz and her husband Jeff were in Cartersville, GA in October for the USDDN Disc Dog World Championships. Jackie always takes "The Quill" with her to read on the road. They are pictured here with Jackie's niece Tanieka Rodeffer who lives in Alabama and came up to spend the day with Jackie on her birthday Oct. 11th. Tanieka being there not only made it a special day, but brought good luck as well! Jackie and their dog Towser finished well over the weekend in the Disc Dog World Championships, and Jeff and their dog Killian ended up on the podium taking 2nd Place in the world-the only American team to place this year! They compete and perform at schools and halftime events such as the Royals game, Skyhoundz Worlds; USDDN Worlds; and the recent Show-Me States. 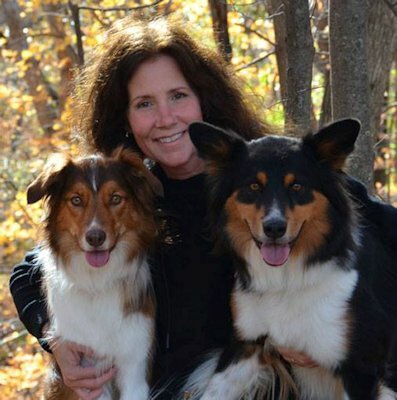 Here is a shot Jeff took of Jackie and "the kids" after placing first and second in the women's distance contest at beautiful Purina Farms in Missouri for the Show-Me State Championships. When you travel, take "The Quill" along and have your picture taken with it and then send it to us. Let's see where all "The Quill" can travel!